The Tuha'a Pae, or Austral Islands (French : Îles Australes or Archipel des Australes), are the southernmost group of islands in French Polynesia, an overseas collectivity of France in the South Pacific. Geographically, they consist of two separate archipelagos, namely in the northwest the Tupua'i islands (French : Îles Tubuaï) consisting of the Îles Maria, Rimatara, Rūrutu, Tupua'i Island proper and Ra'ivāvae, and in the southeast the Bass Islands (French : Îles basses) composed of the main island of Rapa Iti and the small Marotiri (also known as Bass Rocks or Îlots de Bass). Inhabitants of the islands are known for their pandanus fiber weaving skills. The islands of Maria and Marotiri are not suitable for sustained habitation. Several of the islands have uninhabited islets or rocks off their coastlines. Austral Islands' population is about 6,300 on almost 150 km2 (58 sq mi). The capital of the Austral Islands administrative subdivision is Tupua'i. Îles Maria or simply Maria, also known as Hull Island, is a small coral atoll in the Pacific Ocean. Its original name is Nororotu. The nearest island is Rimatara situated 205 kilometres to the ESE. Rimatara is the westernmost inhabited island in the Austral Islands of French Polynesia. It is located 550 km (340 mi) south of Tahiti and 150 km (93 mi) west of Rurutu. The land area of Rimatara is 8.6 km2 (3.3 sq mi), and that of the Maria islets is 1.3 km2 (0.50 sq mi). Its highest point is 106 m (348 ft). Its population was 872 at the 2017 census. Rapa, sometimes called Rapa Iti, is the largest and only inhabited island of the Bass Islands in French Polynesia. An older name for the island is Oparo. The total land area including offshore islets is 40.5 km2 (15.6 sq mi). At the 2017 census it had a population of 507. The island rises to 650 metres (2,130 ft) elevation at Mont Perahu. Its main town is Ahuréi. Politics of French Polynesia takes place in a framework of a parliamentary representative democratic French overseas collectivity, whereby the President of French Polynesia is the head of government, and of a multi-party system. Executive power is exercised by the government. Legislative power is vested in both the government and the Assembly of French Polynesia. Tubuai or Tupua'i is the main island of the Tubuai Island group, located at 23°23′00″S149°27′00″W, 640 km (400 mi) south of Tahiti. In addition to Tubuai, the group of islands include Rimatara, Rurutu, Raivavae and the uninhabited Îles Maria. They are part of the Austral Islands in the far southwest of French Polynesia in the south Pacific Ocean. Tubuai island sustains a population of 2,217 people on 45 km² of land. Due to its southerly position, Tubuai has notably cooler weather than Tahiti. 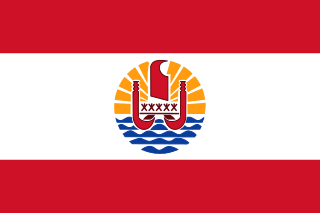 The flag of French Polynesia is the state flag of the French overseas collectivity French Polynesia. It was adopted in 1984. Marotiri is a group of four uninhabited volcanic rocks protruding from the sea, forming the southeastern end of the Austral Islands of French Polynesia. Marotiri is also known as Bass Rocks, maybe according to the name of the European explorer George Bass. Marotiri is very isolated, located about 1,167 km (725 mi) west-south-westward of Pitcairn Island. The closest island is Rapa Iti, 75 km farther northwest, but separated from it by an ocean depth of more than 1,500 meters. The rocks are part of the municipality of Rapa. The Bass Islands consist primarily of Rapa Iti and Marotiri. 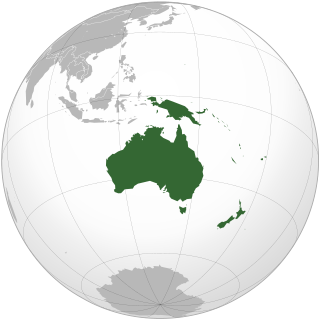 They are usually considered to be the southernmost of the Austral Islands, although this classification is more one of geographic and political expediency than because of similarities between them and the rest of the Austral Islands. The Bass Islands, lying several degrees outside the tropics, are the southernmost islands in French Polynesia. Air Tahiti is a French airline company which operates in French Polynesia, France. Its principal base is Faa'a International Airport. Rurutu is the northernmost island in the Austral archipelago of French Polynesia, and the name of a commune consisting solely of that island. It is situated 572 km (355 mi) south of Tahiti. Its land area is 32.7 km2 (12.6 sq mi). It is 10.8 km long and 5.3 km wide. Its highest point (Manureva) is 389 m (1,276 ft). At the 2017 census it had a population of 2,466. Austral is an endangered Polynesian language that is spoken by approximately 8,000 people (1987). It is spoken only on the Austral Islands and the Society Islands of French Polynesia. The language is also referred to as Tubuai-Rurutu, Tubuai, Rurutu-Tupuai, or Tupuai. In structure, it is similarly compared to Tahitian. Glochidion raivavense, also known by its synonym Phyllanthus raivavense or by the local name mahame on the island of Tubuai, is a species of plant in the Phyllanthaceae family. It is endemic to the Austral Islands in French Polynesia, where it is native to the islands of Rurutu, Tubuai, and Raivavae. Robert Bollt was an American archaeologist, specializing in Pacific Archaeology. Teuruarii IV, born Epatiana a Teuruarii, was the last King of Rurutu, an island within the larger Austral Islands archipelago, who ruled from around 1886 until the annexation of the island to France in 1900. Proclaimed king upon his father's abdication while still a child, his mother ruled as regent. During this regency the Church of Moerari was consecrated and the death penalty was abolished. Tamaeva IV was the reigning queen of the Polynesian island of Rimatara who ruled from 1876 until her death in 1892. French sources refer to her as Temaeva, and one Australian newspaper called her Te Maere, while her tombstone in Rimatara gives her name as Tamaeva. The Flag of the Austral Islands is the flag of the Austral Islands of French Polynesia in the Pacific Ocean administered by France. ↑ Institut Statistique de Polynésie Française (ISPF). "Recensement de la population 2012" (in French). Archived from the original (PDF) on 2014-02-02. Retrieved 2012-08-01. ↑ "Australs Resorts". Tahiti Travel Planners. Retrieved 16 December 2014. ↑ Gillespie, Rosemary G.; David A. Clague (2009). Encyclopedia of Islands. Berkeley, CA: University of California Press. p. 342. ISBN 9780520256491 . Retrieved 7 May 2013.